I think this first quilt is by Pepper Cory. At first glance you would think that you would never put those fabrics together in a million years. But after studying this quilt awhile, it is really great. She has set that dark green leaf block in kind of a trip around the world setting. And, the splash of red really makes the quilt. Then I decided that I needed a photo to see just how she put these fabrics together. It's a great quilt. Beautiful applique'. The tulips look real. I like the way these circles appear to spin. Hop to It! A pattern by Edyta Sitar. Another house quilt. A cabin in the woods. The quilting on this one was great. Each stone on the chimney was outlined and the stitching on the roof makes the shingles look real. This quilt was by Donna that I see twice a year at our Shipshewana retreat. This quilt is made from fabric selvages. She had another beautiful blue and white quilt in the exhibit. Somehow I didn't get a photo of it. The next two quilts have a lot of beautiful applique'. This quilt is just snowball blocks. The corners were smaller than I normally use, and by alternating light and dark the maker made it look like she had pieced tiny hourglass blocks in between the octagons. More beautiful applique' on this quilt. I love the wheelbarrow with fall flowers in the center. Cherrywood fabrics were used in this modern quilt. I took a photo of this to show that it really is ok to break the seal on those packs of beautiful Cherrywood hand dyes that we buy....and to actually cut them and sew them into a quilt! I like this one because the maker used a Patchwork of the Crosses block as her center medallion. This quilt was fascinating. Many hours went into this one, I'm sure. There were so many quilts at the Chicago Quilt show that I wish I had photographed. I wanted to make sure I had time to see all of the quilts and vendors and still be back on the bus ready to come home when the show ended. It takes time to take the photos when no one is standing in front of the quilt, so there aren't as many photos as I would have liked. It was great to see Donna, Char, Valerie from The Quilt Merchant, and Terry and Linda from Back Door at the show. You probably want to know if I shopped any of the vendors. I'll show that next post. I had so much fun attending the International Quilt Show in Chicago, Illinois, this past Friday. Our guild takes a bus trip for the day to the show. Our leader, Dallas, really knows how to put a great trip together. The bus dropped us off right at the door, and when we entered the first thing we saw was this exhibit of red and white quilts. It was really kind of breathtaking. It makes you think (1) if you've made a red and white quilt, why don't you display it all the time.....and (2) if you've never made a red and white quilt - WHY NOT? I'm in category number 2. I have a red and white antique quilt but have never made one. I'll add that to my bucket list. There were lots of quilts in the show. There were many where photography was not allowed. I wanted to know why, so I talked with one of the white glove ladies. Bottom line is that those quilts are featured in a book for sale at the show. Since I love English Paper Piecing so much I gravitated to this red and white hexagon diamond quilt. I also love Dresden Plates. Each ring has 20 blades in it. I love the use of color in this one. Nine patches are always great. This star quilt hung over in the vendor area. I also love sawtooth stars. Maybe I don't really have a favorite block. This house quilt hung on the outside of a booth selling antique quilts. (I like house quilts, too.) It took a bit of studying this quilt to see why all of the houses are turned different directions. When I gave the photo a turn, you can see (below) that if this quilt is placed on a bed (probably a twin sized bed), the houses in the three middle rows are facing the right direction while the two outside rows would be placed correctly for the drop to cover the mattress. Also notice that the doors to the houses are on the right. Most house blocks I've seen have the door on the left side. A look at the crowd in the vendor area. Astronomical Quilts! Quilts made from a block challenge. A Dear Jane. There was a red and white Dear Jane quilt hanging up front in the exhibit. I can't believe I didn't get a photo. This is a beautiful shade of blue. This quilt is made of string blocks cut into 45 degree diamonds. When you look closely, it is a fun study of fabric. I think it was mostly the pink and brown that drew me to this quilt. It also uses that great border from Judie Rothermel. 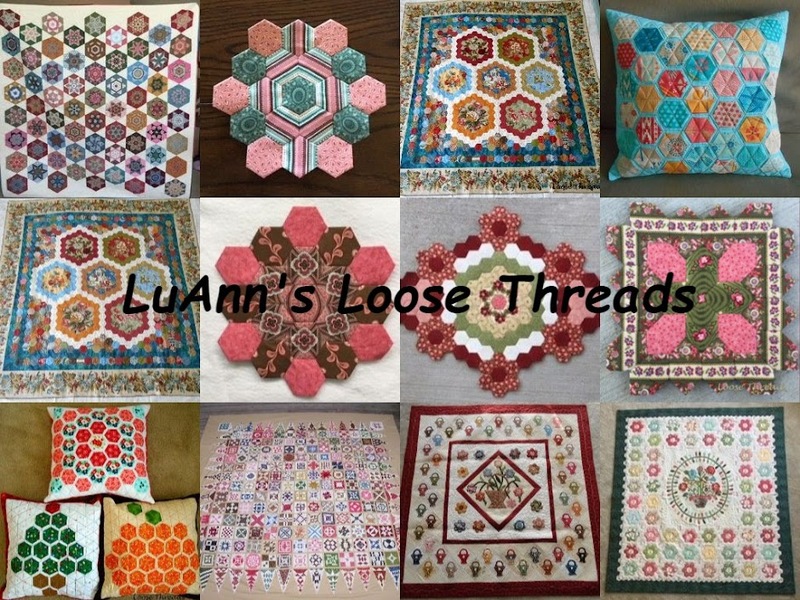 Last, but not least, is this gorgeous hexagon quilt. There is a lot of purple used throughout this quilt - not a color I normally use - but it looks great in this quilt. I'll post the other half of my photos next time. Here is my second block of the Smitten quilt. I really love English Paper Piecing. The center of this block is a 1 1/2" hexagon. The striped hexagons are 1 1/2" with 1 1/2" equilateral triangle points. The rusty red diamonds are 3 inch 60 degree diamonds. Here are my two blocks so far. I think I need to introduce some different colors into the mix. I really wish I had some more of the blue from the block on the left. I'm pretty sure it is a Jo Morton fabric, but I don't know what line it was from. Does anyone know? Hope you are finding some time to stitch today. I might do a bit of stitching on the bus. I'm heading north to the International Quilt Show in Chicago. These blocks have two different sized pieces that make up the blocks. There are a few 3 inch hexagons, sixty degree diamonds, and 3 inch equilateral triangles. Everything else is 1 1/2": hexagons, half hexagons, sixty degree diamonds, and equilateral triangles. Most of the blocks that I've seen on the Smitten Facebook group page are made with bright fabrics. While I have some brights, Kaffe, Brandon, Tula Pink and others, I always seem to return to my Civil War/repro fabrics. And, there are a lot of those that are kind of bright. You can see the comparison between my first Smitten block and my first partial block of the Millefiori Quilt Along. There is one more round that makes up the first block of Millefiori. That block would measure 36" if I finished the next two rounds. This is the entire first Smitten block, and I'm ready to move on to the second block. So I'm off on another adventure. It rained all day yesterday, so I decided to pull out my six pointed stars and start sewing the diamonds around the outside. I like this setting so far. I was going to put 2 inch hexagons (probably all in an off white) in between each of the stars, but I like the secondary "cube" design that happens where 3 of the stars meet. I still have some stars fussy cut that will probably end up in this quilt. I hate to see this project come to an end because I really enjoy English paper piecing these blocks. Each diamond is 2". Here are a couple of stars that I finished last time I worked on this project. I think I got one of the petals on the blue feathery star flipped, but it will blend in with the rest. I've also been making a few more 3" nine patches. I was in a nine patch swap a few years ago and haven't done anything with those blocks, so I'm making a few more to add to those. I hope you are finding some time to spend in your sewing room this weekend. I've been doing a bit of applique' on this block and just finished it last night. The hexagons are 1/2", and the curvy leaves are from Paper Pieces. The package of leaves I have has 2", 3" and 4", and they are called "S" leaves. The 1/2" hexagons are left over from another project. When I'm working on a quilt, I usually make extra blocks so I've got a choice of what I want to use. This block is my own design. I've also been making more hexagons. These are 5/8" hexagons. The papers I'm using in these are some that I have left over from another project. I've been on a mission to try and finish up some old projects. I have a lot of bags and plastic containers with blocks and fabrics in them, and I'm trying to take a realistic look at all of it and decide just what I'm going to finish and what will never see the light of day. I think all of these may just end up in the same quilt. What do you think? Today is our monthly meeting of English Paper Piecing Addiction Club at Back Door Quilts. I always look forward to the inspiration that I get from this group. I have my camera packed.